Author and This American Life contributor David Sedaris has a deep emotional connection with the music he listens to, often imagining himself in the role of the singer. For his Guest DJ set, he tells tales of songs he loves so much he "burned holes" in the records and explains how his ideas about romantic relationships were defined by a 70's folk artist and his love of jazz music was cemented by his father. David Sedaris' newest book is called When You Are Engulfed in Flames. 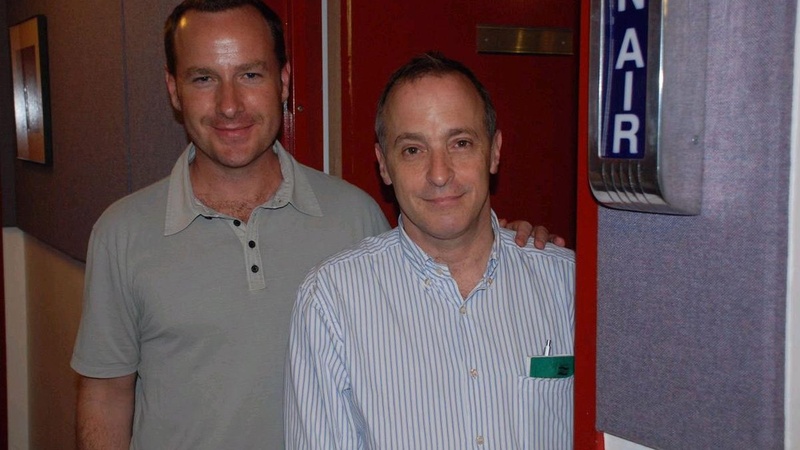 Jason Bentley: Hi, this is Jason Bentley from KCRW and I am here with best selling author and Humorist David Sedaris, who you may also recognize as a contributor to This American Life. Today we will be playing excerpt of songs he has selected that have inspired him over the years as part of KCRW's Guest DJ Project. David, what did you bring for us? David Sedaris: I brought five songs and the first one I brought is a song by Billie Holliday, "Say It Isn't So". My dad is a huge jazz guy. He had 78's and he had albums. I remember seeing the movie Lady Sings the Blues, right, and thinking Diana Ross did such a good job. And my Dad saying, "Oh boy, you've got a lot to learn" and then him playing Billie Holliday 78's for me…and then him taking it back even further and sitting me down to listen to Mabel Mercer. He really did give me quite an education and it's the music that's stuck with me. You know I had little forays throughout my life. Like I'll listen to country music…I was never a big rock guy…but I never really strayed that far from what my Dad listens to. If I lost my iPod, he would be the happiest person who might find it. Song: Billie Holiday's "Say It Isn't So"
JB: First selection from Billie Holliday, What is number two? DS: The second was like a pop song and its "Until You Come Back To Me" by Aretha Franklin. And that is just…a song that…you know every year, every summer my family would rent a house at the beach and every year we had a ‘beach song' you know which was the popular song that summer and it was just a really good year, the year that that was the song. And then later on I broke up with somebody and by then there were tapes and so I had a tape of the song and I played it over and over and over. That's the way I've always been with music. Like my boyfriend, he'll put on…he'll put a bunch of things into the CD player and listen to them all. But I listen to the same song. I just get stuck on a song and play it 30 times, you know, until I kind of get sick of it for a while and then I move on to something else. But I tend also to…like I realize that when my boyfriend listens to songs, listens to music, he's just appreciating the music but I was never…I always have to put myself in it, I always have to pretend that like "Till You Come Back to Me" that's ME singing, like it's not Aretha Franklin-- it's me. I don't look like her, I still look like myself. I just have that voice, right. And my boyfriend left me and then I'm singing this song and he sits in the audience and he hears me and he says, "God, how could I ever have left him? I didn't know he could sing like this". So pretty much all of my songs --it's the same with the Billie Holliday song that I chose -- with all of the songs. I'm always imagining my place in the song. It's very rare for me to just appreciate something from a distance. Song: Aretha Franklin's "Until You Come Back to Me"
JB: David Sedaris is our Guest DJ on KCRW.com. His second selection from Aretha Franklin. Tell us what's next? DS: The next song on my list is Joni Mitchell, "Hejira". It came out in 1976 and I had a friend…I went off to college, and I made friends and they all listened to Joni Mitchell -- which wasn't the kind of music that I ever listened to. But this was my, sort of introduction to her and I guess it just spoke to me. At the time. I was maybe 20 years old and it's an album about constantly moving and traveling. Joni Mitchell is, she's not just traveling, she's moving through a series of relationships and I had never had a relationship at that point. I mean I had a…I longed to have one…and all my ideas of how that relationship would be, came from this album. And I hoped that when I had a relationship, it would end poorly and I would be hurt and devastated and create art from it. Plus, I was hitchhiking across the country and staying in cheap hotels so it was sort of like a…such a young-person's sort of like a romantic young person's life. But I had everything except the person to be romantic with and I think Joni Mitchell made me realize that something was missing. And she made me want to hurt. Boy, I listened to this record. I put holes in this record. Just over and over and over and over again. I still think the writing on that record is really good. I mean, you've got to hand it to Joni Mitchell…. JB: So David, what is our next selection? DS: The next two are my favorite singers. And one is Abbey Lincoln. This is an album that Abbey Lincoln did with Pianist Hank Jones and it's "I Should Care." Abbey Lincoln is…oh my goodness, it's interesting to go and listen to her very first records and then watch how she changes and how far out there she goes and then she'll pull herself back a bit. Like I don't know if you would ever call her voice beautiful, I mean it's not necessarily what you would think of as a melodic singing voice, but it's a perfect jazz-voice I think. I think I heard her…I don't think my Dad turned me onto her. I was listening to the Public Radio Station in Raleigh, North Carolina and there was a jazz station in Durham, North Carolina—that's where it was -- and they played her and I just, Wow. Just from the very first song that I heard I was crazy about her. You know people say that all the time—"I have to be your biggest fan." But I have to be her biggest fan. I really have to. That said--I wouldn't want to see her in person. Like I don't like seeing people in person, like hearing them sing in person. Because I want them to sound exactly how they sound on the record. I don't want any variation, I'm just happy to listen to the songs over and over and over again. Song: Abbey Lincoln's "I Should Care"
JB: Is it a disappointment on some level when you build up an image of someone, that you love their art and their craft, and then you meet them, is it somehow disappointing? DS: Well, the next person on my list is Betty Carter, OK, who died a few years ago. I alternate -- sometimes Betty Carter is my favorite singer of all-time and sometimes it's Abbey Lincoln. But, I first moved to Chicago and Betty Carter was going to be signing records at a book store. She wasn't going to be singing, she was just going to be signing records. I moved there from North Carolina and there was like 14 inches of snow on the ground…and I trudged—miles. It sounds like (old man's voice) "I walked twenty miles to school in the snow and then sold newspapers." I trudged through deep snow in sneakers to see Betty Carter and she didn't show up! Because the weather. She wasn't being a snob or anything, you know, no one in their right mind went out that day -- except me. I just wanted to see her; I just wanted to see…I didn't even need to talk to her just seeing her through the window would have been enough. I'm always afraid to meet people whom I admire. I'd rather somebody else meet them and tell me about it. Maybe I'm afraid of being disappointed. I don't know what I'm so afraid of. And now of course it's too late because Betty Carter is dead. She always played with really young people like she got kids in her band and she taught them a lot. She just always sounds so fresh to me. Song: Betty Carter's "In the Still of the Night"
JB: Classic Betty Carter, "In the Still of the Night" as chosen by our Guest DJ David Sedaris. Thank you so much. DS: Oh, Thank You, Jason.